Hidden within the Baltic Triangle, Liverpool’s creative hub, lies Constellations. A bar located within a warehouse, its structural skeleton kept intact, it seems an odd choice for a record label to host a showcase. Yet on October 1st, Constellations transformed into Fly On The Wall’s stage for the next few hours, a platform for new Liverpool talents to present their music in an intimate venue. The Liverpool heritage of all the acts performing is a key element of the showcase, a factor echoed by the event’s host, BBC Radio 6’s Chris Hawkins. Hyping up the audience with his passion for Liverpool music, his words set a precedent for the rest of the night. It’s a remarkable way of highlighting the amount of local talent, especially as the motivation behind the event is for Fly On The Wall to scout new artists to sign. With five acts performing throughout the showcase, the hope is that all of them would exceed Hawkins’ expectations. Sat alone on the stage with only a keyboard for company, the night’s only solo act, Abbey Stanley, had the tough task of kicking off the proceedings. It may be expected that the first performer on stage would be a more upbeat act, as opposed to a more relaxed set. Despite this, Stanley’s collection of minimalistic ballads did a wonderful job of catching the attention of every person in the room. 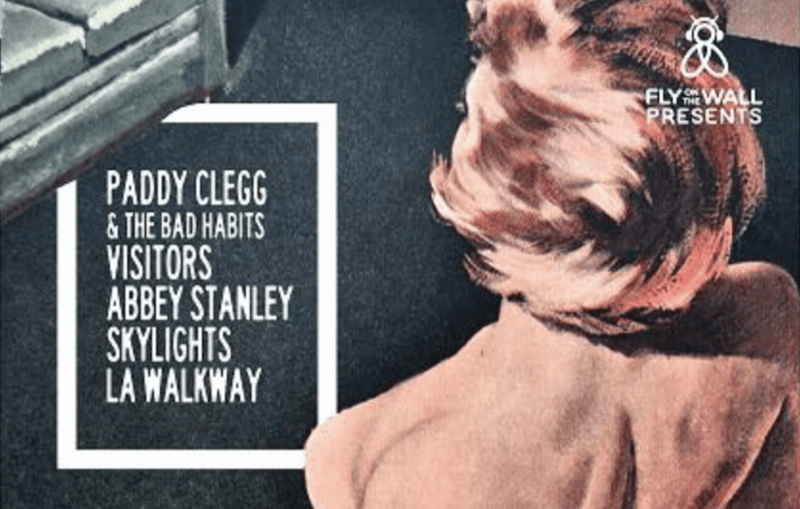 This brand of minimalism is Abbey Stanley’s strongest asset, highlighting both the strong lyrical content of the songs and the soaring vocals that accompany them. Her ability to drive home the emotional power of her music is clear – during one of her songs, ‘On The Line’, she repeated the same line (“I put my heart on the line for you”), sounding more and more heartbroken each time. For Stanley, less is more. Instead of dragging or falling into a lull, her set flowed well and kept all eyes on the young girl alone on the stage, baring her heart and soul. Emerging from the audience, the group of four young lads who made their way to the front of the room felt as if they were crashing the stage instead of performing. With an easy-going attitude and relaxed presence, rock band Skylights were very different from the act before them. Frantic, loud, and frenzied, their music filled the warehouse with ease, yet all their songs, including their single ‘Elastic Girl’, sounded clear without being overpowering. The band worked well as a group, but the moments each member displayed their solo instrument skills solidified how talented each individual member is. Their style of play suggests an easy fit into the rock genre, yet vocally and lyrically there’s an even broader appeal. This, alongside their laidback and fun stage presence, made Skylights incredibly enjoyable to watch. Easily the most anticipated act of the night was indie rock group Paddy Clegg & The Bad Habits. Mixing a folksy style with elements of rock, their music is not only reminiscent of Merseybeat bands but also to indie rock and folk artists currently making their impact on the British music scene. It’s a sound that hit all the right notes for the audience, who were transfixed throughout original material such as ‘Let’s Get By’ and new single ‘Hear Me Out’. No other moment during their performance established how easily this group of lads fit into current British music than their cover of George Ezra’s Budapest, brilliantly mashed up with The Killers’ All These Thing That I’ve Done. The start of the song alone verified how Clegg’s brand of guitar-led folk suits him, but when The Bad Habits transformed the song into a roaring stadium-like anthem, it amplified the star potential the group has. The excitement in the room (including from host Chris Hawkins) attested to the fact that Paddy Clegg & The Bad Habits are more than worth the hype. Next up was Polar States, a band situated somewhere between the straight-up rock flair of Skylights and the indie vibe of Paddy Clegg & The Bad Habits. They stood tall and confident on stage, with the air of a group much more established and experienced than any other in the showcase. After discussing their headline concert at Liverpool’s O2 Academy, as if it were routine for them, the band kick off their set. Their performance was self-assured and their material is strong, as if it had been performed countless times. As a result, Polar States feel very much like a band playing songs from their second or third album, as opposed to a future debut album. Unfortunately, Polar States’ performance fell a little short through no fault of their own. They drew the short end of the stick; being the third rock band in a row, and especially one that bears numerous similarities to the previous groups, the feeling of fatigue was quite strong. Despite this, there was plenty of talent to be seen. The band pulled off more restrained and subdued moments incredibly effortlessly, especially slowed-down song ‘Rush’. Everything about their performance felt polished and experienced, and as a result it would be unfair to write Polar States off. Instead, they’re a band who may shine brighter under different circumstances. The last act of the night, L.A. Walkway, managed to completely shift the mood in the room. As soon as the brass instruments began playing, it became obvious that their set would be a lot more upbeat and funky than anything else in the showcase – a suitable fit considering that the band are a funk band at heart. Their performance demonstrated a range of influences, including rock, R&B and disco, yet their material never felt cluttered with these different genres. This versatility is L.A. Walkway’s strongest asset. Allowing them to tackle each style with ease while still sounding cohesive, the variety within the performance kept the audience on their toes without alienating them. Despite this, the band never completely abandons the funk genre, with their Nile Rodgers influenced sound remaining throughout the set. Tackling original material such as ‘Pretty Lady’ with ease, the upbeat music of L.A. Walkway emerged as the perfect way to end the show. Despite a strong end, by the end of the night it was clear that some artists fared much better than others in the showcase. Paddy Clegg & The Bad Habits, for instance, were the most hyped act of the event, yet were placed third out of five in the running order. As a result, a large portion of the crowd disappeared after their set (including Chris Hawkins), leaving the crowd somewhat sparse for the final two acts. The running order negatively impacted Polar States the most – due to their placement after two crowd-favourite rock bands, their set faced a dip in audience interest. Regardless of scheduling, the night’s acts were a wealth of talent, each with their own appeal and strengths. Talented, varied, and utterly charming, they represented what makes Liverpool’s music scene so enthralling. Each act had its own set of fans, its own style, its own memorable moments, and if anything the showcase has helped their audiences grow. If Fly On The Wall can continue to support Liverpool artists and build a bigger audience from showcases such as these, they certainly have a bright future ahead of them.